This past holiday season, I walked into a store and listening to their holiday jazzy songs piped over their sound system, I waited for the clerk to help me. Waiting half-an-hour, the energy drained from my body. I craved to do nothing for a long time. Nothing. It feels good to write that and to think about nothing. Longing for the peace of no-thing-ness. Happiness free from the strain of what’s next in my life and where am I going, free from the ingredient of financial worry, free from the fear that I’ve lost my dreams—and do I even care anymore? I crave for happiness springing from the unburdened heart, the innate happiness of every creature, large and small. That when we sit down in that happiness, individually and collectively, personally and universally, we feel free and at home. Where did that go? That free wheeling happiness of the child at play. I have felt lost, yet no longer need to be found. I don’t know what to do with my life anymore, and it’s okay. And life goes on even as I wish it would stop. I find myself by sitting and chanting quietly, feeling vibration in my body. I feel myself sitting apart from this world: the books, the things, the stuff, and the decisions. There exists just quietude and me, which is what I most seek. For a moment, I feel happiness, my own, my parents, all Beings. We weave in that happiness together, happiness that lifts us up and up and up. Musing about all the books, seminars, and philosophies that advocate the follow your large dream approach. I, too, have touted such an approach. But sometimes, it’s hard to follow those dreams. How do you move towards them when they remain elusive? You start down one track and then another. Well-meaning people suggest you market, their style. Disappointment ensues. You get sidetracked following yet another set of marketing styles to help you build or find your dream. You trek in a land of unexploded ordinances. Wondering when will it all blowup in your face—rather than remembering the thrill-ride feeling of the climb to Everest that initially inspired your dream. Having goals and dreams is not a bad idea. It’s just that sometimes looking towards the end results leaves us lusterless and weary. Putting on the face of, ‘Yeah, it’s cool, everything’s all right,’ when really you are feeling deep despair, not quite dead inside. One of my sociology professors once admonished me not to become one of them. “One of the walking dead,” he said. Simply put, too much focus on the end game and the rush to achieve is a kind of death to your soul and creativity. So, what do you do when you feel like giving up on your dreams? When you think it’s taking too long with no end in sight or because you can’t—to your own perfectionist high expectations or that of another’s—live up to how you think it should be done? What do you do when you are stranded and lost in a foreign land, with little or no support, with other responsibilities, watching over an elder parent or a small child alone? You follow your dot. One dot. Not the whole shebang, not the multitude of dots, just one dot. Following my dot has become a lifeline these days. Look at it this way: Have you ever relied on MapQuest, Google maps or another online mapping system to get you to your destination? Have you ever gotten lost using them because the directions were outdated or wrong? Meanwhile, your GPS system gives you only the very next step. Siri doesn’t jumble out all the instructions at once. Even when driving in fog, you can still see and arrive to your destination safely if you remain aware of the next few feet ahead. Following your dot is following what’s next, what’s right in front of your nose. And sometimes, that dot may be your next inhalation. The breath that helps you center again. 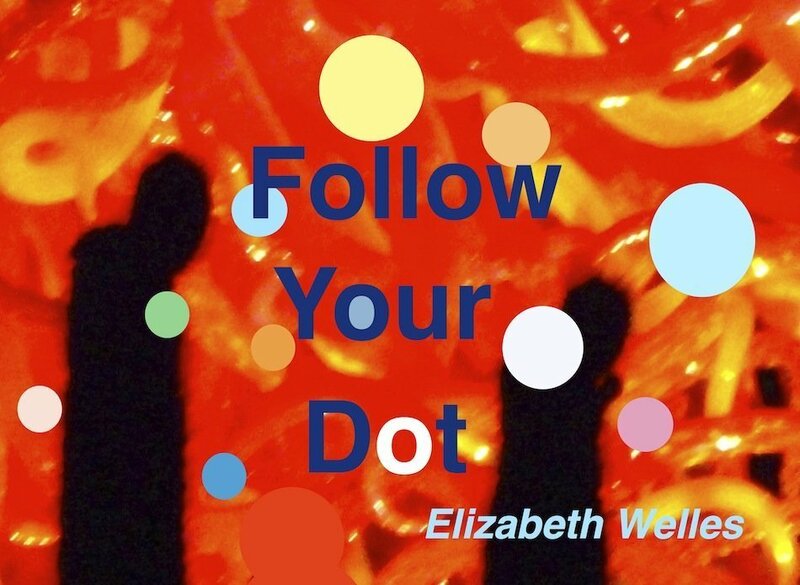 Turn to the riveting exploration of your individual dot, even if your dot is to do nothing for a while, and see where it takes you. Don’t even try to connect the dots, for that happens in retrospect. It’s simple to follow your dot in theory. But it’s not always easy when you feel pressured by time or space, threatened by a falling bank account, illness, or any other set of circumstances that might have you squirming in a thousand directions at once. Along with pressure from the status quo, what everyone else out there is doing, questions or prying from well-meaning family or friends reinforcing their fears upon you. Have you followed their dots instead of your own? Have they suggested how you should live your life? Have you followed all their advice but still wound up at ground zero? Feeling you did something wrong or feeling a failure with your whole life’s plan down the drain. I’ve been there. I’ve felt that way. But when a friend suggested I follow my dot? That I could do. My dot these days has been cleaning clutter. Creating physical order in the living environment has been my dot and savior. It makes me happy. Finding more space, I breathe easier. Another example of following my dot came almost a year ago. I had tea with a friend of a friend in a town a few hours away. This person suggested, in passing, that my work might be appreciated at the local renowned art center. Fast forward to a meeting with the director at that center. A meeting that could not have gone better. I was invited to be the keynote speaker for their Artist’s Retreat and to teach regularly at the center. Between when I met my friend’s friend to the time I met with the director, a period of several months had passed. There were many dots followed on multiple tracks during that time. I had no idea they would all be related until later, and that a brief cup of tea with a friend of a friend would be one of the singular dots in the larger scheme of things—and part of my own unique and organic marketing plan. Perhaps the making of big plans or the design of how we move towards them is becoming antiquated, in favor of stepping out in faith not knowing exactly where we are going. It may seem paradoxical, but my life works best when I trust the mysterious movement of life’s direction without micromanaging or controlling it too much myself. It’s also when I feel most happy and free. For my life’s direction is not my own. It does not always bow to my desires. It has its own intelligent wisdom and design regardless of what I want. But still leading me in the direction of my dreams even if it’s in a circuitous way or by following one dot at a time. I increasingly hear stories of people living in similar ways. With the political-social climate of the world, tremulous and ever more so since 9/11, people with plans months in preparation find themselves having to suddenly shift and change. It soothes me in knowing that sometimes when there is no ground under your feet that is when you begin to fly. So, while I pray for the happiness that transcends this world, the happiness that Spirit feels, this is my plan and path: I will follow my one single dot. I will keep cleaning clutter. I will respond to the invitations and referrals I receive without pushing or pulling myself apart, as I have so often done in the past. And I will patiently wait for the next dot to appear knowing I don’t have to run after them, for dots do show up one dot at a time. So what is your dot today? Just for today? When well-meaning friends and relatives ask you for your life’s plan, I wish you the courage to follow your one single dot. When you look at the news and discouragingly wonder what’s it all worth anyway, I wish you the peace of sweet nothingness. That your inhalation be filled with your Spirit’s breath. Quiet and powerful, uplifting and strong, complete with happiness that transcends this world and yet touches all things in love. May you have a dot-filled year with many unexpected blessings that grace your life and way.